Stop by our dealership and discover our great offers at Country Hills Hyundai. Check out this amazing new Hyundai Elantra Sport 2018 near Calgary. This Grey model has logged 10 km. You can buy this Hyundai Elantra Sport 2018 at a great price of $27107. It's a Sedan with 4 doors, Manual transmission and Front wheel drive. This Hyundai Elantra Sport 2018 is powered by a 1600cc engine that runs on Unleaded fuel. 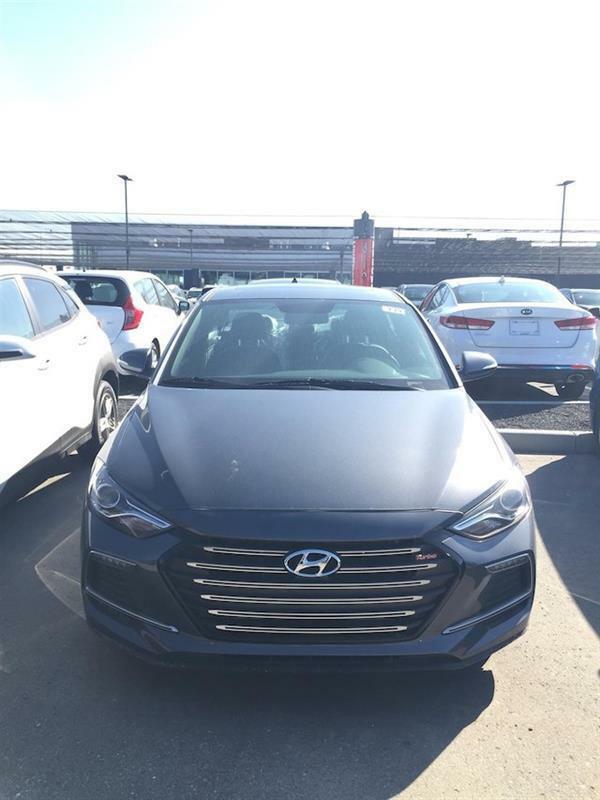 If you'd like to learn more about this new Hyundai Elantra Sport 2018 for sale in Calgary, don't hesitate to contact us by phone at 403 984-9696. Our 2018 Hyundai Elantra Sport Sedan shown in stunning Gray! Powered by a TurboCharged 1.6 Litre 4 Cylinder that offers 201hp for peppy acceleration while tethered to an engaging 6 Speed Manual transmission. Our Front Wheel Drive Sedan achieves an incredible 7.1L/100km on the open road while making you smile with advanced technology performance and style. As you observe the exterior the well-placed curves and muscular stance of this elegant sedan are mesmerizing. Inside the beautiful cabin you are surrounded with a variety of amenities such as luxurious leather heated front seats and a huge power sunroof. High Definition audio that supports Android Auto and Apple CarPlay a 6-speaker audio system with MP3 available satellite radio and USB and auxiliary input jacks all set in a 7-inch touchscreen. Our Hyundai Elantra Sport also rewards you with peace of mind thanks to the rearview camera brake assist traction control and multiple airbags. Safe stylish and efficient our Elantra certainly stands out and is an intelligent choice for you! Print this page and call us Now... We Know You Will Enjoy Your Test Drive Towards Ownership!